Mensusa https://www.mensusa.com/articles/mens-turquoise-sport-coat-colorful-sports-coat-to-get-a-classy-appearance.html Mens Turquoise Sport Coat- Colorful Sports Coat To Get A Classy Appearance Mens turquoise sport coat and purple sport coat upholds a matured and sophisticated dressing sense that wins you appreciation from the people around you. www.mensusa.com holds an impeccable collection on colorful sports coat for affordable pricing. Sports coat is indeed a comfortable and high-fashioned choice of attire that promises to accentuate your appearance in the most glorious style. In instances of semi-casual, business casual as well as travelling or attending any open-air events, it is hard to get a stylish outfit that would be as comfortable as the sports coat. Men had identified the sports coat as one of the most stylish and trendy attiring. One of the unique features of the sports coat is the color. You can say that men loves the sports coat as it hues up their appearance. The option like the mens turquoise sport coat holds the potential to add flair and grace to the appearance of the men that enable them to earn appreciation for their fashion pursuits and impressive dressing sense. The mens turquoise sport coat would be a stylish attire for instances you are dressing for a semi-formal or open-air event. It would also be a delightful choice in instance you are travelling. Even if you are about to attend the casual parties, the turquoise sport coat would be a good choice as attire. You would look fabulous pairing these coats with a deep shaded shirt and trouser. Combination of the sports coat with jeans and tee-shirt would be considered a smart, sleek yet elegant choice of attire. The white sport coat is another candid option that the portfolio of the colorful sports coat holds. The best part about the white shaded sports coat is that you can pair it with any given shade of shirt, trousers as well as the fashion adornments. The white shade makes the sports coat equally ravishing as an option for the daytime as well as the evening occasions. Though the spirit of the sports coat is towards the casual sides, it would not be the slightest mismatch to pick the mens turquoise sport coat or the white shaded sports for the business casual or the even the formal occasions. Colors of the attires play a major role in gracing your appearance. 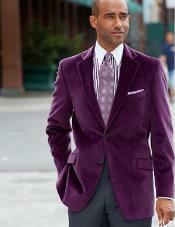 Selecting the purple sport coat you can be assured that you would appear classy and appealing. Purple is a shade that is eye-catching yet looks very soft to the eyes. Hence, the purple shaded sports coat, just like the mens turquoise sport coat gives a nice impression about the taste, preferences and the dressing sense of the wearer. You would be able to pair these sport coats with the light shaded as well as the deep colored shirts and trousers alike. Likewise, the color is appropriate for the day as well as the evening dressing. On the whole, having a purple sport coat in the wardrobe, you are actually having dressing solutions for all sorts of attiring needs. Displaying gravity and featuring softness, the blue sport coat is an option in the portfolio of the colorful sport coats that are sure to flair your appearance. The benefits in having the attires like the mens turquoise sport coat or the blue shaded sport coat in the wardrobe is that you can wear these attires in all sorts of occasions and you can pair the maximum shades of shirts, trousers as well as the accessories with it. The blue color sport coat matches with all sorts of complexions and skin tones. The best part is that it imparts a tranquil flair that makes you to appear elegant, classy and sophisticated. The most common shade in men's fashion, the mens black sport coat, combine the elegance & appeal in the shade of black with the trendy spirit of the sport coats. The combination gives you a lethal power to penetrate deep into the hearts of the people around you. The options like the black shaded sport coats and the white sport coat are comprehensive attiring solutions for the widest scopes of dressing needs. You should visit www.mensusa.com for the widest options on top graded and fashionable colorful sport coats at reasonable pricing.